The city-owned Oregon Trail Reserve is surrounded by homes. After a fast and hot-burning grassfire killed a woman and destroyed homes there in 2008, the Boise Fire Department began looking at new ways to deal with wildfire. The department used a grant from the Southwest Idaho Resource Conservation and Development Council to start using a different strategy: grazing goats to thin fire-fueling plants. 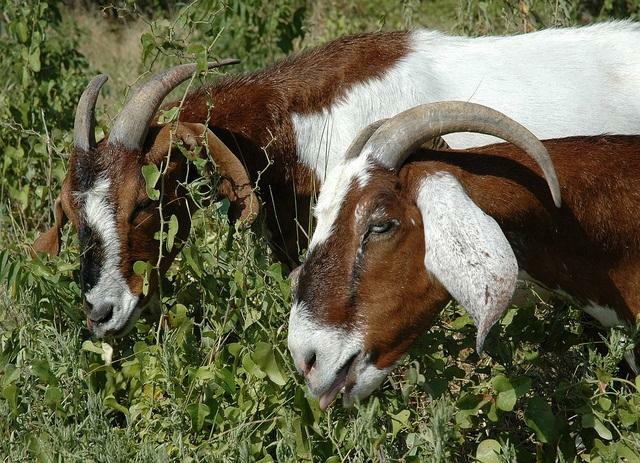 The goats are notoriously good eaters, and help thin both native and non-native plants that fuel wildfires. Sara Arkle manages the foothills and open space for the city. She says certain trails will close in the reserve as the goats move through the area in June and July, with the goal that the open space will be protected for public use long-term. Arkle says she knows how much the trails mean to people who use them. "[T]hey want to be able to access this place because they love it," Arkle says. "And so we're going to have to ask them in return to respect the trail closures ... So it's just this give and take consistently between the community, the land management agency with this very complex habitat." Arkle says there are always tradeoffs in any land management strategy, especially in the wildland urban interface. "That's the focus is the wildland urban interface, where you have that really fast hot burning vegetation right up next to homes and communities." But she says the four-year goat grazing project has been successful so far in managing the fire-prone native and non-native plant species, without doing damage to the trails in the area. Idaho is among 12 states that will share $10 million from the Interior Department, which will be used to keep the threat of wildfire to a minimum in sensitive sage grouse habitat.